Saturday morning I ran the race I’ve spent months preparing for. I pondered over training plans, ran long miles on snowy roads, stewed over small injuries, tried out new flavors of gu and probably drove my husband and dogs half crazy with the whir of the treadmill during wee hours on winter mornings. 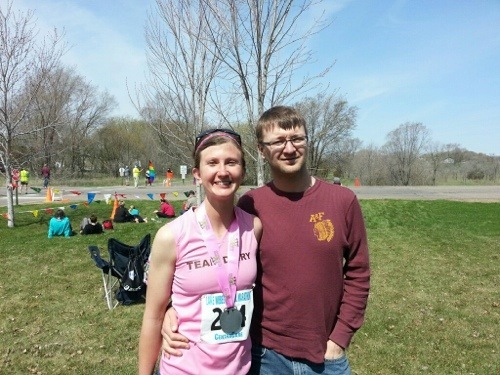 Last spring, I ran a marathon almost on a whim. I really didn’t have enough miles under my legs, but I wanted to just do it. I needed to do another marathon before 26.2 miles went back to feeling like an impossible feat. With a combination of nice weather, a healthy body, and a large dose of grace, I had a great run about twenty five minutes faster than my first marathon attempt. This spring, things were different. I started the year planning for a marathon and trained accordingly. I ran more miles. I found ways to fit in longer runs during the week, and I had a great twenty mile run as opposed to a rough one. I asked God for strength and balance as I incorporated this training into my life, and I was sure it would all add up to an amazing race. I had visions of 3:45 dancing in my head at one point, but when pulled rib cage muscles and an angry shin caused setbacks I once again focused on that magic 3:59. Race day finally arrived, and I left my house in the black of pre-dawn. A bright sunrise welcomed runners as we boarded buses to the start, and I knew we would have a beautiful day. The morning was brisk at just under 40 degrees for the 7:00 a.m. start, but warmth would be coming. Soon we were running, first one mile through the outskirts of town and then on to the Lake Wobegon Trail. Green hills and fields, curious cattle, barely budding trees, and several clumps of stubborn snow greeted us as we went. People chatted here and there, but it was mostly a blanket of quiet for several miles. Then I came upon two fun people, let’s call them Kalli and Craig. Or rather, they came upon me. I was wearing my homemade Helen Keller sign on my back, so they knew my name before they even got to me. Everything was fair game for conversation, and I learned Kalli won the first several years of this very marathon with times well under 3:20. She was coming back from foot surgery, and I felt lucky to be running near such experience. The miles flew by, and whenever I glanced at my watch I’d see 8:40’s – 8:50’s. Right on target. Maybe a little ambitious, but it felt fine. I eventually lost these two when they made a pit-stop, but soon I came upon another group of friendly women. (You really can and do meet people while running a marathon!) They were all from the Twin Cities and were also going for a sub-4-hour goal. The sun was warming things up at this point, and I remarked that it would be hot out by noon. We all smiled when someone said we’d see the finish line before 11:00. They paused at the next water stop, so I continued on my way. I passed the half way point feeling good in just under 1:58. For my readers who don’t run, I should explain what “feeling good” means. It doesn’t mean that you’re not sore/tired and starting to feel the effects of running for two hours. To me, it means nothing hurts like crazy, I’m reasonably hydrated, and I believe I can keep going for another 13.1 miles. These things all checked out, but I knew I couldn’t suddenly increase the pace yet. If I could just maintain I’d be happy with my finish. Somewhere between miles thirteen and fifteen Kalli and Craig caught back up to me. They were friendly companions again as we talked to the chirping frogs, sang bits of songs, and traded encouragement. Everyone was more tired than the early miles, but we still had stories to trade. I found myself alone again at mile sixteen, at which point I thought about ten miles to go. I pulled out my iPod for the first time all day, as the trail had gotten less scenic, my legs more tired, and the sun even brighter. I forced down another gu around nineteen miles, and at twenty I was happy to feel okay and see 3:01-something on my watch. That gave me about 58 minutes to run the last ten kilometers and still hit my goal. Game on. At this point in the race, I really start to take things mile by mile. Twenty-one was okay, twenty-two was harder, and by mile twenty-three things started to come apart. I put a licorice twist in my mouth, and it tasted so chalky I had to spit it out. I walked through the next water stop to drink a full cup of both water and gatorade, and my stomach sloshed with every step. Then, it happened. I heard someone calling off paces behind me and the four hour pacer appeared. I’d introduced myself to him at the beginning, and now he told me I was right where I needed to be. I knew my legs weren’t moving as well as his though. 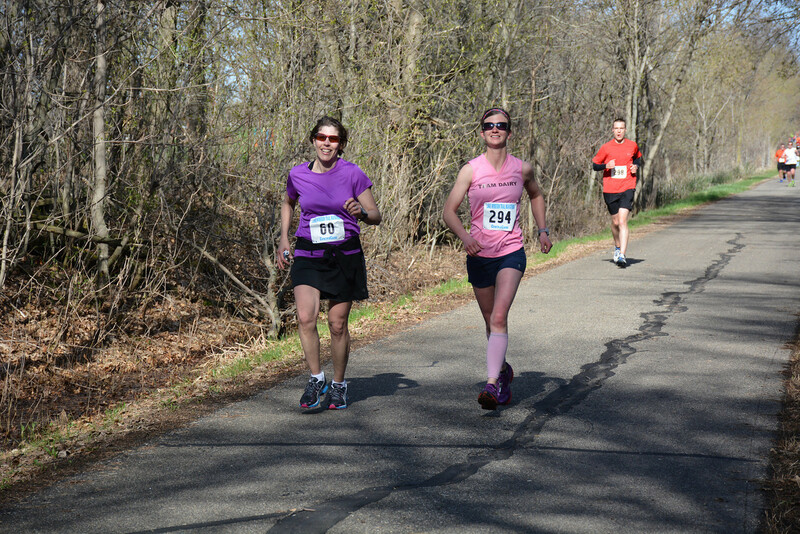 He said we were seven seconds ahead of pace, and I fought to keep up with him as I thought about my goal. I was running and running, but I wasn’t staying with him. I tried to channel some anger and thought about how frustrated I would be to miss my goal. That didn’t make my legs move faster either. My hamstrings were so tight that I decided to stop and stretch for just a second. 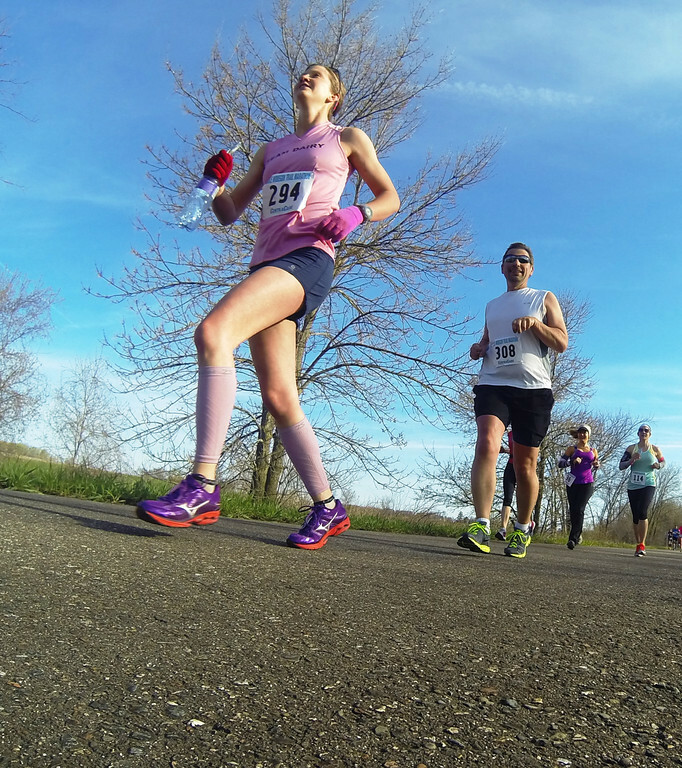 I never stop to stretch during a race, but this was proving to be the most painful of any of my marathons. I had just started moving when Craig appeared again, and he said something encouraging enough that got me jogging. With only a few miles to go I usually get a second wind, but I could muster nothing extra. This being a small race, there also wasn’t a flood of spectators and cheers in the final miles to gather energy from. All the encouraging mantras I used during training were gone from my brain. The only thing I could think of to focus on was “can do.” I said this aloud as Craig and I jogged along otherwise in silence. 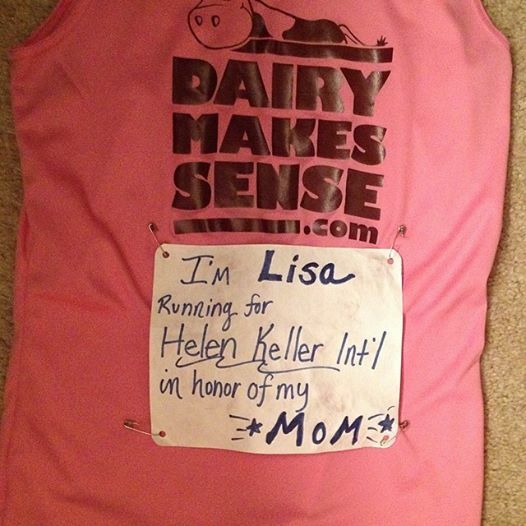 I was running for my Mom and the cause we’d picked out together, so that kept me moving too. She and my dad and JR were waiting at the finish, and I never doubted I would get there. I knew when I saw them I’d find the energy to smile and run the last few minutes strong. None of them had ever seen me finish a marathon before, and I lamented that they wouldn’t see me before my four hour goal. Finally, a small competitive thought fired in my brain. I realized if I didn’t start moving faster I would miss a PR. I needed better than 4:05:05. Going in I thought this would be a given, but here I was plodding along like a turtle. I picked up my legs a little higher and saw the last water stop in the distance. By this point it was nearing 70 degrees with bright sun. I know that doesn’t sound hot, but to my pale, winter-acclimated body it felt steamy. We also had a straight headwind for the last half of the race once we made our solo left turn. Apparently for the first time in the race’s history, we had an east wind. It was mild at probably 8-10 mph, but after running into it for nearly two hours it felt epic. The plus side was it felt cool on my face! I drank more water at the last stop and then kept running toward the streamers at the finish. You can see them several miles out, but they were getting closer at last. I didn’t know why I’d fallen apart so badly, but I ran a little faster as I’d promised myself I would. I saw my dad snapping pictures as I came into the finish. The clock proclaimed what I already knew. 4:03. A small, two minute PR. My legs buckled a little, but I got my medal, water, and thanked Craig for his encouragement at the end. 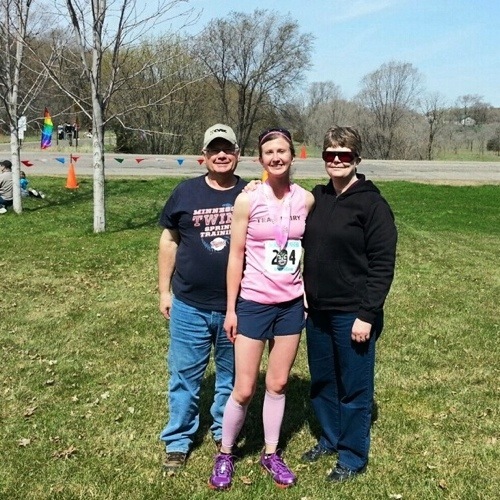 Small races have many perks, such as being able to meet your family within steps of the finish. I found mine right away, and we wandered to an open spot so I could stretch out and we could hear each other talk. They were nothing but congratulatory and positive. I can’t say enough good things about this race in general, from the friendly volunteers and director to the organization and spirit of the race. A big thanks to the photographers for taking and freely providing so many good race photos. It truly is Minnesota nice. 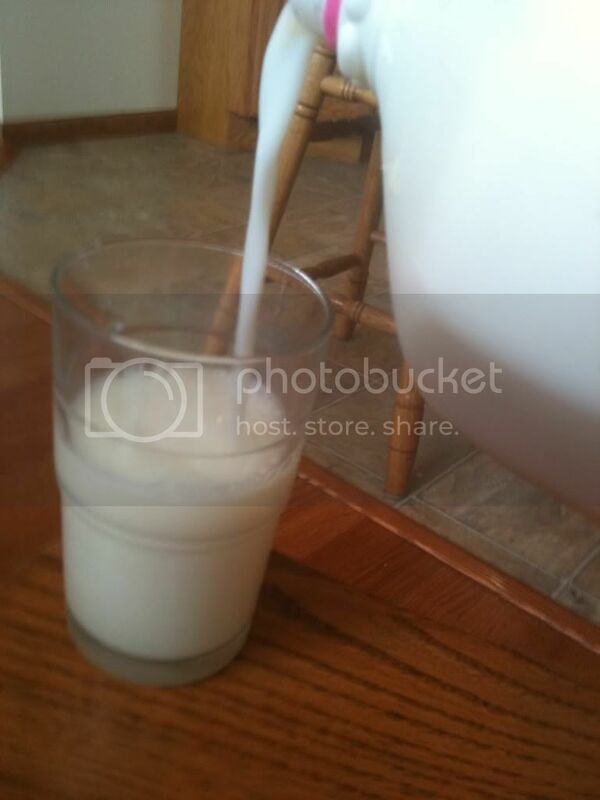 As soon as I had my chocolate milk drank, my dad set to work taking more pictures. We went to eat after that, and I feebly tried to make myself presentable by washing my face and pulling on my clean finisher shirt. The waitress apparently didn’t notice my sweaty state because she commented that it was good to see us out celebrating Mother’s Day. Speaking of, I hope all you had a wonderful Mother’s Day. Whether you are a mom, have a mom, or are missing your mom this year, we all have someone to celebrate. JR and I headed back to the finish just in time to see the clock hit 6:00 and mark the end of the race. 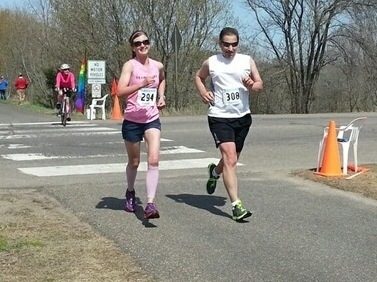 I found Sarah, who I’d met at the start, and we shared a celebratory picture at our hometown marathon. I’m still trying to analyze what went right and what went wrong. The sun and the wind in the second half weren’t ideal, but overall it was a gorgeous day to run. Especially compared to the rain, wind, and cold we’ve had for most of this spring. I did have some setbacks and missed miles in my training, but the work I did really made me believe I could hit my pace goal. I started out a little bit fast, being lured on by the nice weather. If I would have stuck to exact pace the first half, would I have had enough energy left at the end? I’ll never know, but I don’t regret meeting and running with the people I did. One of my goals was to find a buddy, and I accomplished that in style. My other goals were to “relax and enjoy the race” and to “go for it.” Other than maybe the last few miles, I enjoyed this race to the max. It was so pleasant and friendly that you couldn’t help but soak it in. And I went for it. I came up short, but there is always another marathon. Certainly I’m disappointed, especially as I sit here in my post-race soreness and try to reconcile my missed goal. Still, running is just running. There will be another day to train and another marathon to run. God knows better than I what’s in store, and maybe there’s even a bigger reason why I ran 4:03. If nothing else, it taught me to take my own advice and respect the marathon. Sometimes she’s got her claws out. I know I can still be thankful for the people I met, the cause I supported, and the people who supported me. Thank you all. 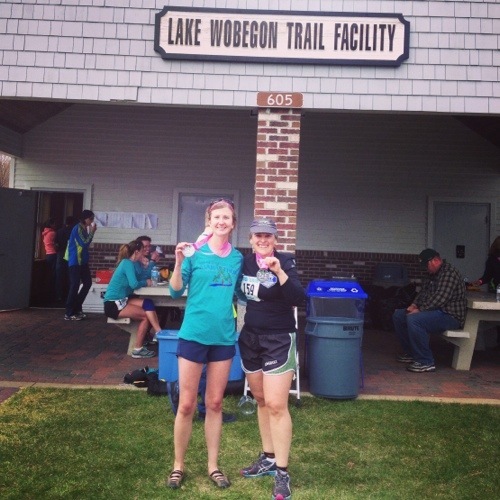 This entry was posted in Race Reports, Running and tagged lake wobegon trail marathon, Minnesota spring marathon, race report. Bookmark the permalink. Wow! 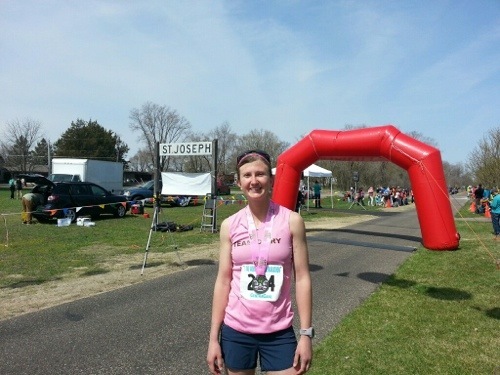 Great job – running and blogging the marathon! The race starts in Holdingford, which is thought to be one of the main inspirations for Lake Wobegon. And the trail itself is definitely named after Keillor’s work, so you have a pretty good point of reference! 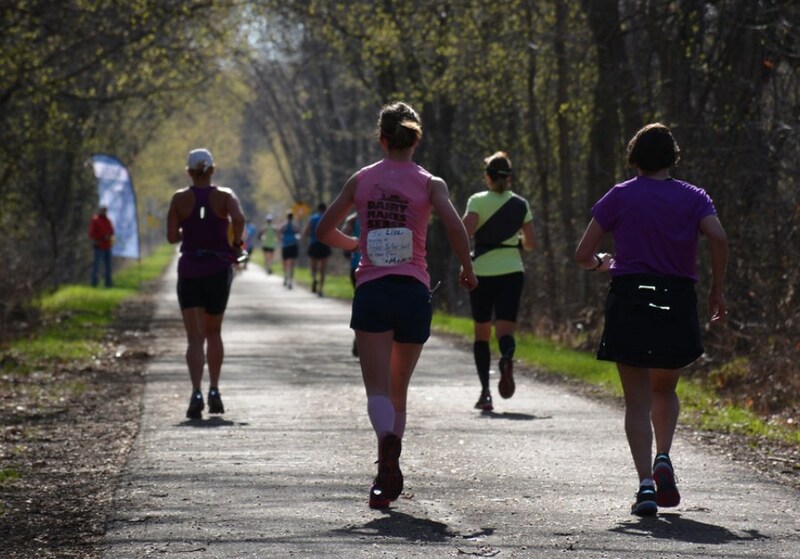 This was a great race report, Lisa–so well-written! I’m sorry it didn’t have the outcome you were seeking and had trained for, but the marathon as you said is fickle (70 degrees is NOT trivial in a marathon ever). You will get that sub-4, I just know it! Congratulations! 1. You mentally and physically trained for a marathon. 2. This is not your first marathon and you ran a personal best. 3. You did a good job representing multiple passions, running, the dairy industry and a cause you believe in. 4. You had a great race experience. I like your attitude “God knows better than I what’s in store, and maybe there’s even a bigger reason why I ran 4:03.” Keep your chin up and listen to what God is telling your heart. Thanks for all the thoughtful tidbits Robyn. This is a happy list! Congratulations on a great race! You should be proud! Ha, yes! It is SO easy to look back and think I should have been able to tough it out. Sometimes you just have nothing in that moment. As I think about it, I see a rather poignant illustration of human weakness. Perhaps God is making a point to me? Congrats on finishing with a PR! Once you realized you missed the sub-4, your goal changed to getting a PR and you got it. It’s great that you were able to persevere to the end. That’s true; a goal shift can be important to latch onto! Thank you, Tina.